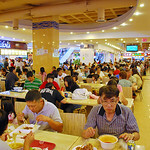 The mall features an exciting food court in the lower level with over 32 different American and ethnic food vendors. With a wide range of foods from different areas of North and South-East Asia; stalls offer Malaysian, Thai, Viet-namese, Chinese, Korean and Japanese foods including bento boxes and sushi, ramen noodles, and assorted Asian desserts. 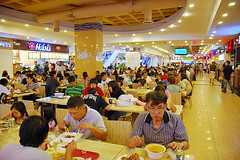 In addition, the food court offers a great choice of fast foods.